Photography was revealed to the world, both in France and in Britain, in 1839 and it did not take Wheastone very long to ask William Henry Fox Talbot, the inventor of the Calotype process, to make stereoscopic pairs for him. Talbot and his assistant, however, had never done such a thing before and the angle they used between the two pictures necessary for the recreation of the illusion of depth was so wide that the photos could not be fused. 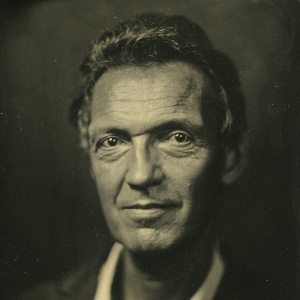 Wheatstone then tried to obtain two different perspectives with the Daguerreotype but the mirror-like appearances of the images did not stand being observed through the mirrors of his reflective stereoscope. The Stereoscope, though used in physics laboratories, consequently failed to catch the attention of the public. It was not until the Great Exhibition of 1851 and the use of a lenticular stereoscope – also invented though quickly discarded by Wheatstone then re-discovered by David Brewster and developed by French optician Jules Duboscq – which enabled the two stereo halves to be stuck side by side on the same support that 3D caught on, slowly at first, on account of the cost, and then in a way that was unprecedented and gave rise to a craze which, it seemed, would never stop. Stereoscopic photographs, on metal first, then on paper, were soon made of buildings, monuments, streets, and even people, and became the first mass-produced photographic images. A Bevy of Girls, after Fanz Xaver’s Winterhalter’s The Empress Eugénie surrounded by her ladies in waiting. Published by the Gaudin Brothers in 1855. As early as 1855, however, pictures appeared that were re-staged for the stereoscope in the photographers’ studios … from oil paintings! It started in France, at the time of the Paris exhibition and the first examples, made from paintings on display there, show a 3D rendition of Franz Xaver Winterhalter’s The Empress Eugénie surrounded by her ladies in waiting , and of John Everett Millais’ The Order of Release. These two images were published by the firm Gaudin Brothers , who were soon imitated by other photographers. The Order of Release, after John Everett Millais’s painting. One of the most famous of these re-stagings was made by James Robinson, of Dublin, after Henry Wallis’s 1856 Death of Chatterton. The original card is, however very rare, Robinson having been tried on charges of copyright infringement just days after he published it. The Master of the Rolls could not understand that Robinson’s image was not a photograph of the painting but a patient re-creation of it using his apprentice as a model and pointed out that the colours were identical! This honourable man obviously did not know anything about photography but as a result Robinson was banned from selling the image. It did not prevent Birmingham photographer Michael Burr from releasing a similar card about a year later and from selling it in all impunity. Michael Burr, The Death of Chatterton, after Henry Wallis’s painting. “We have had laid before us some productions of an invention which opens up an entirely new field for stereoscopic pictures, by rendering views taken from paintings or engravings as solid and apparently real as if they had been photographed from the subjects which the paintings represent. Till now no stereographic cards of engraving have been made, for the good reason that they would not have had any more relief than the engravings themselve, and would have quite wanted the charm of apparent reality which renders the stereoscope so popular. If this invention can be applied to any painting or view on a flat surface, which from the specimens we have seen we have no reason to doubt, there will be produced by and by stereographs of many of our most remarkable pictures, which will have a charm by this means added to them never dreamt of by their producers. This will be doing a service of no small value to the man of moderate means. The stereoscope has been called the poor man’s picture gallery, and it is indeed so, placing within the means of a poor household the power of possessing excellent transcripts of nature and works of art, and which possess that essential quality for becoming favourites in small establishments — the taking up of little house-room. John Sang’s 2D to 3D conversion of one of George Cruikshank’s etchings from The Bottle. This article, I think, says it all, which is why Dr Brian May and myself extracted from it the expression “the poor man’s picture gallery” and used it as the title of a book we devoted to the subject of flat images (paintings, but also illustrations from books and cartoons from the satirical magazine Punch) patiently and painstakingly re-staged into stereoscopic photograph. The photographers behind those reconstructions were probably trying to make money (why not indeed?) but also, we believe, to educate their customers by placing before their eyes some of the most popular works of art of the time , which they would never have been able to access or afford otherwise. It is important to point out here that the stereoscope isolates the observer from the outside world  and, in doing so, helps them concentrate and focus on the image they are looking at. There is no way one can simply glance at a stereoscopic image. It has to be studied carefully, literally “explored”; the eyes have to linger on the various planes, on all the details of the picture and it is a more rewarding experience than looking at any flat image. The Victorians, who, as we read in the press of the time, could spend one hour examining all the characters in paintings by William Powell Frith, were aware of the fact, which explains why there are so many stereos of statuary for the stereoscope but also why a lot of staged scenes contain a wealth of objects and knick-knacks. Stereocopy loves clutter and photographers, who knew their customers well, made the most of it in their compositions. Michael Burr, 1865. The Troubles of Single Life, after Erskine Nicol’s painting The Onconvaniance of Single Life. 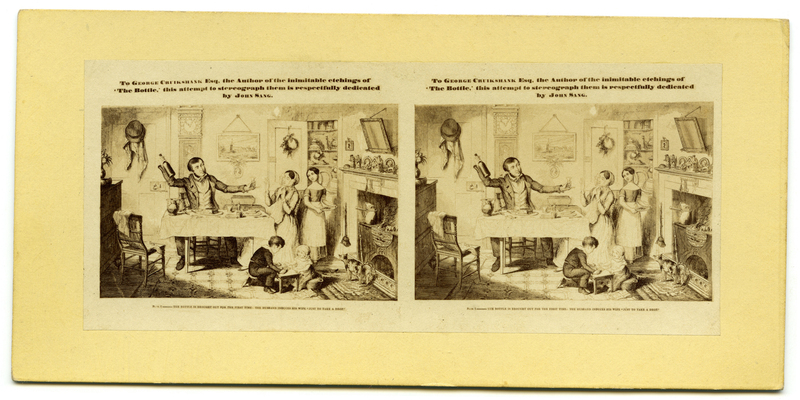 A good example of clutter in the stereoscope. There are a lot more examples and stories in our book The Poor Man’s Picture Gallery . There are also lots of stereoscopic images after IPunch* cartoons (over 80 stereos were made after these). The strangest part, however, is that a number of stereocards were, in turn, used as models for some China figures which, under the name of Fairings, were sold or given away as prizes in fairs. There is no end to how surprising and fascinating stereo photographs can be. It is high time they were properly re-discovered and appreciated as they ought to be! All the illustrations in this article are from Dr Brian May’s collection. 1. The Athenaeum, No. 567, September 8, 1838, p. 650. 2. Fife Herald, Thursday August 30, 1838, page 2, and Birmingham Gazette, Monday September 3, 1838, page 2. 4. Alexis Gaudin and his brother Charles were as big publishers of stereocards and stereoscopes in France, as the London Stereoscopic Company were in Britain. They had the advantage of being able to advertise their ware in the weekly photographic journal La Lumière, which they owned. 5. This commercial aspect has, unfortunately, been used against stereophotography by art and photo historians alike. Stereos were not “art”, therefore they have been looked down upon and almost totally neglected for decades by researchers. They still are in a way, although people are gradually realising the wealth of information these small pictures contain and how precious they are in revealing some aspects of Victorian society which were never illustrated by flat but more “conventional” photographs. But that’s another story! 6. The Times, October 19, 1858, page 7. 7. Denis Pellerin and Brian May, The Poor Man’s Picture Gallery, published in 2014 by The London Stereoscopic Company. 8. Sadly, a lot of these once popular paintings are now totally forgotten, and the current location of some of them remains unknown. 9. Like VR or gaming goggles do nowadays. 10. We found over 60 paintings and illustrations from books made into stereos but there are probably as many more and we occasionally chance upon a new one which we had never seen before. This is an endless quest, made even more difficult by the fact that a lot of the paintings that were used as sources of inspiration have not been seen in decades and have been lost or stored away far from the public eye in museums’ storage rooms or in private collections.